What is today Silenus Winery began in 1968 as a walnut orchard. The orchard was converted to Cabernet Sauvignon vineyards and the grapes sold to Robert Mondavi, Inglenook and Clos du Val. After discovering that the grapes consistently ended up in the various wineries’ reserve wines, the Winery was born with the first release in 1980 of the Newlan Cabernet Sauvignon. The winery was the 35th winery in Napa Valley post-prohibition, and quickly became recognized for its red wines, winning awards both internationally and domestically. The winery has been in constant operation since 1980 as Newlan Vineyards & Winery and Koves-Newlan Winery and is now known as Silenus Winery. Located between the towns of Napa and Yountville just West of Highway 29, the winery and vineyards sit snugly in the middle of the Oak Knoll District. The vineyards are blessed with mineral-rich, gravelly soil deposited over millennia by Dry Creek, which borders the northern edge of the vineyards. The close proximity to the San Pablo Bay graces the fruit with warm days and cool nights - the perfect environment for creating small lots of ultra premium wines from the distinctive soils of the Oak Knoll AVA. Silenus Winery is named in honor of Silenus, the mentor and companion of Dionysus, the Greek god of wine. Silenus raised Dionysus from a child and taught him to focus on the most important things needed for a full life of hedonism and pleasure! Key among the teachings was the art of planting and caring for grape vines in order to make the best wine possible. During ancient times wines were often flavored and sweetened with honey and so Silenus taught Dionysus how to raise bees to make the sweetest and most flavorful honey possible. Silenus and Dionysus traveled the lands far and wide and hosted parties. While traveling they always carried with them their Thyrsus, a staff of giant fennel topped with a pine cone. The Silenus Winery Thyrsus label pays homage to Silenus and combines all the elements that were taught to Dionysus, a Thyrsus emerging from a newly planted grape vine that is encircled by bees. Please join us for an experience you are sure to remember. Our chic tasting room with floor to ceiling windows, exquisite walnut tasting bar and casual seating offers a pleasant and comfortable atmosphere without pretension. We feature a private sit down tasting room which accommodates up to ten guests, and for those who enjoy the outdoors, we offer a patio with fountain, wonderfully landscaped grounds, a lawn area, picnic tables, stage, and of course the requisite Napa Valley bocce ball court…… all of this in our beautiful vineyard setting. Wine Education: We pride ourselves on educating our customers about all aspects of wine and the winemaking process. 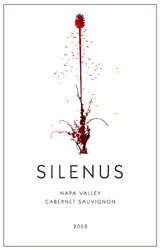 To join the wine club, visit www.silenusvintners.com or call 707-299-3930. Silenus Vintners’ Wine Club offers wine lovers the opportunity to enjoy the limited production wines from our circle of boutique, artisan Vintners. Each Club package is a unique selection of new releases and exclusive offerings. Our ever changing selections allows us to provide interesting and diverse Club packages. You’ll be among the few who receive small batch, boutique wines rarely distributed outside of Napa Valley and the San Francisco Bay Area. • Four (4) bottles of wine, four times per year (March, May, October & December). We do not duplicate wine selections, so each Club package is unique. •Club packages will be approximately $200.00. CA sales tax and shipping are additional. • 15% discount on all purchases and 20% discount on case purchases (mixed cases welcome). • Invitations to exclusive Club events, many of which provide the opportunity to meet our Vintners face to face and share their passions. Plus premier invitations and discounts to our winery events. • Complimentary Bar Tasting for you and 3 guests each time you visit (party of 4). Napa County residents may receive a 2 for 1 tasting. Silenus Winery is certified under the Napa Green Winery Program by the Napa County Department of Environmental Management (DEM) and the Association of Bay Area Government’s (ABAG) Green Business Program and completed all the regulatory components needed for environmental sustainability. These components included developing water and energy conservation methods, preventing pollution, and reducing solid waste. In addition to developing sustainable winery practices, this program is set to become the standard for the state of California. Silenus Winery is certified under the Napa Green Certified Land Program. Silenus Winery has created and implemented a customized farm plan with measured results that addressed all aspects of its property, vineyard land as well as non-farmed land, including practicing soil conservation, water conservation, stable drainage, riparian corridor enhancement, fisheries and wildlife habitat enhancement and long-term improvement and sustainability.